Injectables: Are Dermal Fillers What I Need? As we age, our faces lose subcutaneous fat, which gives us volume and fullness. As that fat is lost, our facial muscles get closer to the skin's surface, making creases more noticeable (e.g. marionette lines). An injectable like a dermal filler can restore this volume and fullness to the face, lessening the appearance of wrinkles and decreased facial volume. Plus, it can also give you the facial symmetry and lips you've always wanted, too! If you're wondering if dermal fillers are right for you, here are a few things you need to know. Depending on the dermal filler product used, results can vary from 6 to 12 months, or even longer. (More on that in sec.) Therefore, it's best to start off conservative and increase later. In fact, most patients will likely need more than one injection to achieve the desired effect. Also keep in mind the health of your skin will affect the results. One more reason to take good care of your skin! Dermal fillers are commonly used to soften wrinkles and facial creases like nasolabial folds (e.g. marionette lines), augment lips, and enhance sunken cheeks. They can also aid in improving the appearance of recessed scars and improve contour deformities. Since it is an injection, there is a risk for potential side effects. Common side effects include pain at the injection site, bruising, redness, swelling, tenderness, itching, or rash. If infection or severe allergic reaction occurs, contact your doctor immediately. There are several types of dermal fillers. The most common types are the following FDA approved dermal fillers: calcium hydroxylapatite (Radiesse), hyaluronic acid (Juvederm, Restylane), polyalkylimide (Aquamid), polylactid acid (Sculptra), and polymethyl-methacrylate microspheres (Bellafill). While each type fills, they are also different. Key differences are the degrees of softness, chemical makeup, immediate results, and how long they last. As a result, different dermal fillers are better suited for certain targeted concerns. For instance, a "softer fill" would be used for lips whereas a "harder fill" for cheeks. 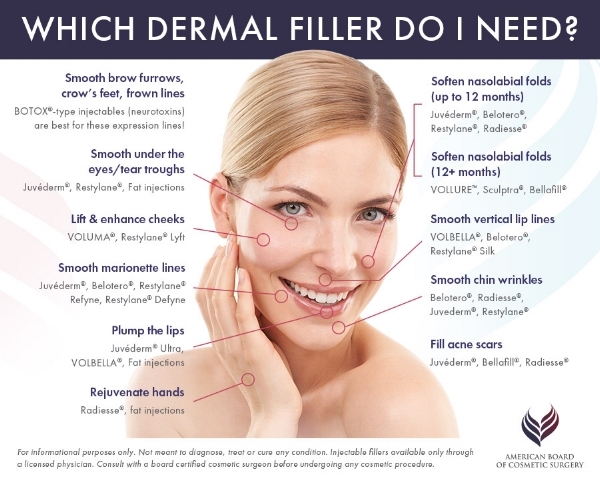 Your doctor will determine which dermal filler is best for your desired targeted area. Look for a provider who has a background in cosmetic medicine and training, with experience in performing dermal fillers. These include certified and licensed physicians, physician assistants, registered nurses (RN), and nurse practitioners. Schedule a consultation to go over questions and expectations beforehand. Brr It's Cold! How Is Your Skin Doing? Is winter sucking the life out of your skin? Restore your glow with a facial. Give us a call at 302-656-0555, 302-378-8880 to book your service. And stay in the loop, by asking to get placed on our INTEREST LIST FOR UPCOMING EVENTS, too! Injectables: Is Botox Right for Me? Throughout the day we make many facial expressions: smiling, squinting, frowning. Overtime those types of facial expressions (and others) can form dynamic wrinkles. Dynamic wrinkles are wrinkles created by facial movements. To treat these types of wrinkles it requires Botox, an injectable. If you're wondering if Botox is right for you, here are a few things you need to know. Botox is a neurotoxin derived from Clostridium Botulinum. Injected in small concentrations, the compound binds itself to the receptors in the muscle, affecting the nerves. By blocking the nerve signals to the muscle, it temporarily paralyzes the muscle causing the wrinkle. Gradually the wrinkle softens, or even disappears, however only temporarily. Results typically last 3 to 6 months. The best results are in 1 to 2 weeks, and it's always better to start out with less and go back to get more if needed. If you get too much the first time, it will take a while to wear off. Botox is commonly used to treat frown lines, forehead lines, between the brows, crow's feet, skin bands on the neck, and smoker's lines. It can also provide a temporary brow lift. In addition to fixing wrinkles, Botox is also administered to individuals for non-cosmetic treatment. 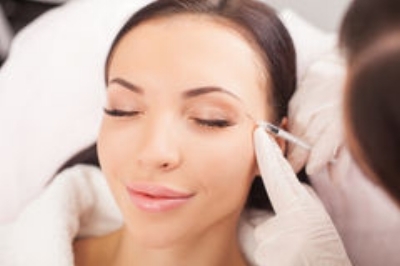 Botox can help alleviate the symptoms of medical ailments such as severe migraines, TMJ, hyperhidrosis (excessive sweating), strabismus (lazy eye), and overactive badder. Like any medically administered injection, there is the risk of side effects. Pain at the injection site, bruising, redness, or infection may occur. Should you experience persistent or worsening dizziness, difficulty swallowing, nausea, headache, muscle weakness, etc. contact your doctor immediately. Make sure you go to a certified and licensed professional. In the U.S., only licensed physicians, physician assistants, and nurse practitioners can administer Botox. And some states have additional guidelines, too, so be sure to consult those as well. When selecting a medical professional to administer Botox, look for qualifications, registration, and reviews. And don't hesitate to schedule a consultation, too. Botulinum Toxin Type A is the injectable neurotoxin commonly found under brand names like Botox Cosmetic, Dysport, and Xeomin. Botulinum Toxin Type A products are dosed differently and the onset of how quickly you notice results can vary between one to 10 days. While Botox Cosmetic and Dysport are pretty much the same, here are the main differences. If you use Botox Cosmetic first, and later switch to Dysport, you'll need a higher quantity of Dysport to achieve the same result. Also Dysport has a smaller molecule size than Botox Cosmetic, so it works faster and diffuses more, resulting in a larger area of spreading. This can be beneficial when treating larger areas. But if you need to target smaller areas, Dysport may be less effective. Once you say adios to your dynamic wrinkles, next make your eyes pop with luxurious lash extensions. (You'll be wide-eyed and wrinkle free). Give us a call at 302-656-0555, 302-378-8880 to book your service. Also ask to get placed on our INTEREST LIST FOR UPCOMING EVENTS, too!